This interview had me catching up with a notoriously evasive man: my good friend Bryan Bailey. It’s hard to not like ‘Beetle’ Bailey, as many players came to call him during that 60 & 3 era. His working relationships and numerous accomplishments have earned him the label of Eminence Inlier, in my book. But Bryan Bailey had once been an outsider, too, even by strength staff standards going back as late as 1990. Do you remember the movie Good Morning Vietnam? Near the end Robin Williams’ character’s nemesis Sgt. Major Dickerson is informed that he’ll be sent to the island of Guam to serve out his remaining enlistment, to which he moanfully replies, “Guam, sir? There’s nothing going on in Guam! Why Guam? 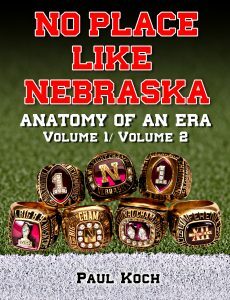 !” Beginning his tenure blocks away at the Devaney Sports Center weightroom (the Guam-esque equivalent of a thousand miles removed from Nebraska Football) he found his ‘in’ by way of a few Husker stars reaching out for miracle cures, and for history’s sake we can thank the likes of Steve Taylor, Von Sheppard, Richard Bell, Ken Clark, Reggie Cooper and Mike Croel. These young men could be found discreetly sneaking over to the Sports Center to rehab their injuries with this skinny, freckled, little red-headed guy whom Boyd had somehow kept hidden out of sight. But kids talk. And he was just too good to be kept a secret. Even in hushed tones, word got out, finding their way to the big man at the top. And just as Tom Osborne spotted a talent in Boyd Epley twenty years previous, the intuitive and fearless leader knew he had something special in Bryan when he brought him over from the crackerjack box of a weightroom over at the Devaney Sports Center to West Stadium’s massive confines. No longer whiling away at the purgatory of a sports-performance outpost, Memorial Stadium’s strength complex was now his playground. And oh boy, could he get an injured athlete back into the mix: many times faster and stronger than even before. In the Steve Pederson/Bill Callahan shakeup he was shamelessly told to pack his bags and head back to ‘Guam’ in order to make way for a Pederson crony. But a pretty sharp fellow by the name of Pete Carroll – who knew a thing or two about talent – speedily coaxed him away to southern California, much to USC’s great gain and pleasure. 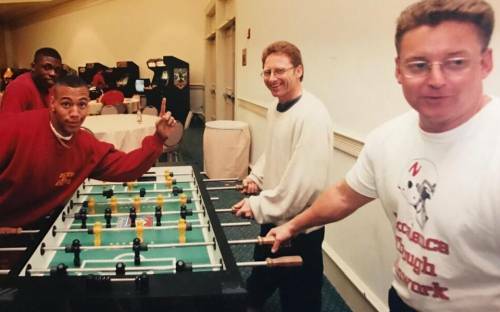 You would frequently see Bryan roaming the sidelines during USC’s greatest years, and be sure that Bryan Bailey and football success for both programs was a strong cause & effect relationship. Why? Because simply put, Bryan developed champions. Period. Question: What brought you to Nebraska Football? Bryan Bailey: I heard there was a job Boyd Epley had in strength and conditioning, where I could work with the other sports. I figured it was a good opportunity. Back then you either worked with football or you worked with the other sports. You had five people that worked with football and then you had one guy working with the other sports. (laughs) You’ve been there, you know what kind of challenge that is. I was working on my PhD in Exercise Physiology. It didn’t seem like anything was opening up, so that’s what I decided to do. I worked 40 hours per week and tried to go to school. Then I got hired on and there was this football player named Steve Taylor: he’d hurt his thigh and was afraid he wasn’t going to be able to play in the Oklahoma game. So he came over to the Devaney Sports Center and we did some work in the swimming pool. Somehow we got hooked up and worked together. He said I helped make it so he could play in the Oklahoma game, and he told Tom Osborne after that. So Tom Osborne made me a part of the football program and the rest is history. Q: Was Von Sheppard in there somewhere, too? BB: Von Sheppard. He was there. Steve Taylor and Von Sheppard. Von had torn his ACL — one of the best athletes they’d seen in a long time back then. Last I heard he was a teacher in Minnesota up there. They were all really good friends; the relationships are more important than anything, an inspiration in that they want to be something. And you can help them reach for it. To potentially help them meet their goals? That’s something that was important to me. Q: Bryan, I know this is excruciating because you don’t necessarily like to talk about yourself…..
BB: It is. But Steve Taylor and Von Sheppard, they were the key to getting me in because they came and found me. Remember we had the Reel Runner machine over there in that little Devaney Center weightroom? BB: That’s how it all started. Steve Taylor and Von Sheppard came over, and that’s how I got found. Q: So they brought you over to football and created a special position for you, the title of Reconditioning Specialist or something like that? BB: Yeah, they knew I was a little odd. (laughs) The (organizational) flow chart they had did not contain the kind of things that I did. Instead of just following the mainstream I used to look at things that could possibly happen to put a person in a successful situation so they’d feel better about themselves. It’s a nice way to do things –going with the current- but to get somebody, to get into the gray area between their ears and get them inspired toward moving in a positive direction is more important that just following the status quo. It’s nice to have more to offer than that, and if you can get their brains going in a positive way of working and looking at things, they heal a lot faster. I still believe that. Q: It’s equally important for the athletes to know how you’re doing something and why you’re doing something that actually doing something? BB: Yeah, not “Just follow what they tell me to do.” I think it’s about a more important concept: it’s called cooperation. I call it ‘tapping in.’ When they are tapped in, everything else going on in their life is ‘tapped out,’ and if you can get them focused on that, they can get better. Some people say, “I really can’t do that.” Well, that’s part of the problem. There’s a lot more to a person’s make-up than what they can’t do, because it’s more important to focus on what they can do. Once you make up your mind to work on the things you can do, it opens up things and you make the progress. Q: How did you get them to focus, to ‘tap in’ on the things that one can do? BB: Just by using my position, the place that I held in the weightroom. And they trusted me, that I had a personal interest in them. It just wasn’t, ‘What can I get out of this?’ They knew I really cared about their well-being and wanted them to get better. And part of the process is getting them to reach their potential, it’s not just, “Okay, I’ve got this potential.” You might see a person with a lot of God-given ability and everything is fine and dandy when things are going right, but once things go wrong and they have an injury, they don’t know the proper way to work and they don’t know where to start. And that’s where somebody else has to intervene and show them how to put themselves back together, because they’ve never been there. Once they can figure those things out, when they get to feel what it’s like to be an average person, you’ve got to slow things down for them until they get back to speed. Q: It seemed to me you were part strength coach/mad-scientist/motivational guru, and maybe even part sadist. Where do you feel you fit in the whole scope of the program? BB: (laughs) Other people might say I was the mad scientist. But at the end of the day, I had to look at myself in the mirror. And was I doing it to be a selfish person or a selfless person? I tried to do what I thought was right, tried to do the best with what I knew at that time. Many times I‘ve had to apologize for doing things that haven’t been helpful to an athlete. I’ve probably made more mistakes than any other strength coach out there. But if you can never say that, then you’ve never worked with great athletes. I’ve been very, very blessed. I’ve trained the best, I’ve worked with some of the biggest names in athletics. That’s a blessing. When they show up to get better, what will you say you’ve accomplished with that person? You sometimes want to piss them off… and if you piss them off they become aggravated, and they’ll come back the next day and try to get better. Some might say, “Never put them in a position to look bad.” Well, I want to make them look bad in a good way, because if they can handle that, when it comes to going out into the real world then they’re not as scared of being ridiculed for what they do on the field. BB: Yes, I agree with you. I just think there is a lot we leave in that reserve gas tank, because the ‘unknown’ is uncomfortable: “If you put too much out there, I might get hurt.” But if they trust you enough, they put it out there and they give it back to you. That’s what was great about being a little piece of machinery in that great big clockworks that was headed by Tom Osborne. It was about the process. If you give it up -if you sincerely give it up?- if you work with kids and they trust you, they’ll walk on water for you, show a great trust. And then you’ll see greatness. Listen. I have no greatness, but I get to work with greatness. And you stroke that greatness. (You can either stroke it or inhibit it with ridicule.) And many times you have to stroke that greatness and allow it to grow and make it struggle and go through all that, help them figure out that they have more to give than they thought they had to give. I think one key is to see greatness in them before even they can see it. I just think that’s a key to life, if you care about people. Q: You were simply exposing them to realizing their full potential? BB: It’s about exposing them to who they want to be. Let’s face it, it’s a very scary world. What people don’t realize -and I understand this a lot better than most, doing this as long as I have and seeing some great athletic performances- yet at the same time I’ve seen how fragile some of those people are. What these athletes do is very unique, and once you get to talk to them behind the scenes and know them, you understand that they can be really scared of a lot of things, how they can be ridiculed for who they are, for what they do out there. And that’s just one aspect. And that’s probably one of my biggest aggravations, because they bring so much more to the table than just their athletic talent. I’ve known more people who’ve been Academic All-Americans, I’ve known more people that have gone on in life… Troy Branch, for example. He didn’t make it in the NFL, but he’s a great lawyer. I came back to Lincoln one time and he introduced me to his wife and his kids. He said “Bryan, I’d like you to meet my family.” That means a lot, because it tells you that somewhere along the line we became family, it wasn’t one of those dysfunctional families that we all belong to. Nebraska was one of those places -where if you show up and you let your barriers down and put it out there, “and even if I’m not very good, I’m going to work myself as hard as I can”- and they did. That’s why it worked. We were family.